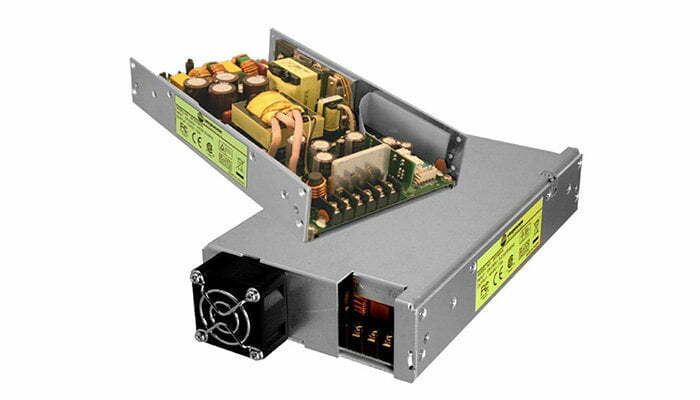 REM-360P Series are Single Output 360 Watt Medical Power Supplies, available in U-Channel and fully enclosed formats with top or end mounted fan. REM-360P series 360 watt medical power supplies have Universal AC Input from 90-264VAC with outputs of 12V, 24V, 30V, 36V, 48V, 54V and 57V. REM-360P series 360 watt medical power supplies have approvals to the UL60601-1 3rd Edition, CSA22.2, No. 60601-1 3rd Edition and EN60601-1 3rd Edition, offer Class B line emissions and will operate over a wide -20°C to +70°C ambient temperature range. Current Share Error <10%, 4 units max. 1. Maximum output current/power for U-Channel models with 30cfm forced cooling at 40°C. 2. Maximum output current/power for models with cover/fan at 50°C. 3. Maximum output current/power for U-Channel models with free air convection at 40°C. Cover with end-mounted fan: Replace -U with -E.
Cover with top mounted fan: Replace -U with -T.
Looking for the ITE Approved version of this product? Click HERE.